Since I rather miss daily blogging but not having to think of a topic every day, I decided to daily blog the progress on my viking toys. This way, I will keep on track and will hopefully finish well before my 24 December deadline. With 2 hours per night, I have about 32 work hours left to get these little guys finished. So day 1 finished with a single viking helmet. 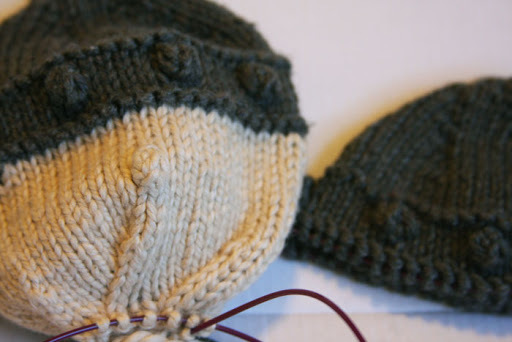 After about 2.5-ish hours worth of knitting last night, I have two helmets and one viking face. That may not seem like much, but these are very large, I’m discovering. I’ll have to post a picture with something for size reference. So far, the pattern is super easy to follow and other then the bobbles, it’s been smooth knitting. Just a bit putzy since I’m working worsted weight yarn on US size 4 needles–taking my gauge into consideration, that’s like a more “normal” tensioned knitter working on 2.5s. So yeah, this is some dense fabric, even if it doesn’t look it. The pattern was written for non-washable wool, but I think it’s working up very well in a 100% cotton. We’ll have to see what tomorrow brings! Yay! I missed your daily blog posts. Can't wait to see the progress on the Vikings. Looking good! How's your hands? Has it gotten any easier working with the cotton? Susan: The cotton isn't bad except for the bobbling, the two PFBs especially. Thankfully, I have one left as a nose on the second viking and then no more for me! WHEE!! :DI think if I were to work all day in cotton at this gauge, it would definitely put the hurt on my joints. I hear you. Good thing there is only the nose left then and no more bobbling!